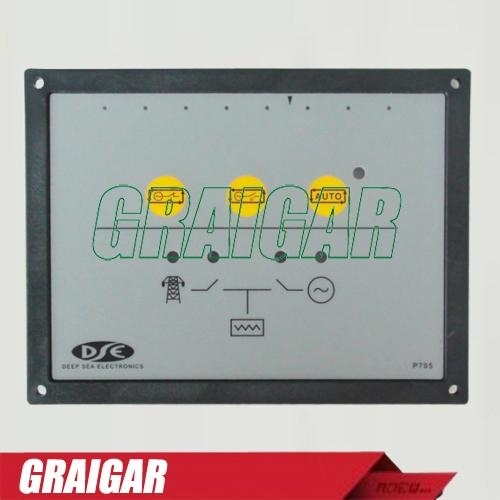 The DSE705 is an Auto Transfer Switch Control Module that has been designed to monitor the mains (utility) supply. When the mains (utility) power fails the module sends a start request to the generator control unit. When the generator is up and running the module transfers the load across. When the mains (utility) returns the module transfers the load back and removes the start command. The generator should then begin it's shutdown procedure. The module can be configured so that they follow the users pre-set start and stop sequences. Manual Off Load-This is used to manually start and run the engine off load. Should the mains (utility) supply fail, then the load is transferred to the generator automatically. Manual On Load- This mode is used to manually start and run the engine on load. Auto Mode-This puts the module into automatic mode, where it will await a mains failure. Upon detection it will send a start request to the generator control unit. DC Supply: 8 Volts to 35 Volts DC Continuous. least 10 V before dropout and supply recovers to 5 Volts. Start Output: 1.2 Amp DC at supply voltage. Fuel Output: 1.2 Amp DC at supply voltage. Auxiliary Outputs: 1.2 Amp DC at supply voltage.